The paid up share capital of a Argentina LLC is US$300 and of a Stock corporation is US$3,000. Companies get a 50% reduction on employers’ social security contributions in the first year and 25% in the second year of employment. Company registration in Argentina takes 12 weeks. If our Client needs to start a business in less than three weeks, Healy Consultants will be please to provide our Client with a quick and effective solution. Healy Consultants company registration specialists will assist our Client with finding shelf company services in Argentina. Our Client will own an Argentina company in one week. Argentina has been ranked 32nd in the world for its oil reserves. The nation has the 33rd largest national reserves of natural gas, of around 379 billion ccu. An emergency fund worth 5% of annual profits has to be maintained by companies till it reaches 20% of their capital. Prohibition on acquiring foreign currency for saving fund purposes. 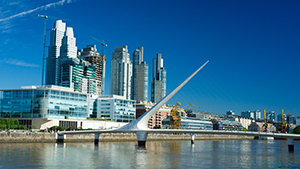 Dividends and capital gains received by foreign entrepreneurs from their Argentinian business will dwindle in the coming months. The Argentinian peso has already lost 22% of its value against the US$ since January and most analysts expect another peso devaluation before the end of the year. Argentina has been poorly ranked at the 92nd position (out of 137 countries) in the Global Competitiveness Index 2017-2018, mainly due to its i) poor macroeconomic environment caused by high inflation rates, high taxes and unstable policies and ii) inefficient government bureaucracy largely due to widespread corruption. Average monthly industrial space rental is a mere US$0.50 per square foot.